Where are the real (business) men…?! What I do not mean is Gordon Gekko’s “Greed is good“. James Bond figures, martial arts black belts, famous actors and bearded men don’t classify by default either in my opinion. Which brings me to my next point. What defines the public opinion? No-one would argue that this not important, apart from those who profuse not to care about public opinion or that it shouldn’t matter. If it matters or not is irrelevant to my current argument; we all seem to be blind to the fact that we don’t practise what we preach. We reason one way yet act another, so we’re all hypocrites…? Well, I would dare to state, … yes. How can I be so harsh? For one I know myself and in addition to that it is one of the fundamental psychological pins that many fiction and non-fiction books hinge on. Take a person who’s made some bad choices, stack the odds against him and watch as he struggles to come out on top. We like an underdog, why? Because we identify with them, we all struggle we all make mistakes. We’re all human right? So why does public opinion matter then? It does because it shapes our thinking, colours our emotions and as a result affects how we behave, talk, interact and work. Get to the point already…! What I’m getting at is that public opinion often subconsciously(?) turns out to be our ethical thermometer. Some local and recent examples relevant to the UK. I don’t vote because the system is sick to the core. If enough people stop voting it will send a signal that the system has to change. If nobody would vote the system would break down and a better one would have to be put in its place. These are popular opinions today, there may be variations but at the core the same message resounds. Many know it’s wrong, and why? Because (many) people got hurt. If nobody (excluding government) gets hurt then good on you for getting away with it, we all know we all need to look after ourselves. Nobody’s going to do it for you, we’re all grown-ups here, work hard and don’t let anyone take your hard earned cash. It’s a lie that not voting constitutes a vote against the system. What it is is an abdication of your opinion to the general opinion, effectively saying “I’m for whatever everyone else says”. Which is the exact opposite of what most people I know who don’t vote think they’re doing. The way to vote against the system is called a ‘protest vote‘ or ‘blank vote’. This is relevant due to the false sense of security by means of “security is bliss”. Hiding from the truth does not make us less guilty or responsible, in fact it’s plain and simple immature. We all know that bankers can’t be trusted, they pay themselves huge bonuses after getting their banks bailed out for billions. CEO are up there too, giving themselves massive bonuses while sacking people kicking them out the back door. Again it seems to harmless, but it’s a generalisation hidden by layers of veneer of so called ‘truth’. Guilty as charged, yes indeed I hold the view that there are a lot of people out there who fit this stereotype. But I refuse to believe that ALL bankers and CEO’s are like this, sadly I haven’t made friends yet with those who do break the mould. Our mistrust of government is deeply rooted, nurtured by decades of democratic childish behaviour, scandals and broken promises. Let our yes be yes, and our no be no. So shall we start here? Rather than tell others to do a better job, how about we ourselves model how it should be done. I believe this is applicable to everything we do, not just politics or banking. I admit this is a vulnerable position to put yourself in, but it’s the only option available in order to break with hypocrisy. So make up your mind, be truthful yourself, in every way you can. Or hold your tongue about others, who are we to judge when the root of the crime is the same? We hate to admit it but most of us default to this mode. What we fail to see is that we do so under the pre-tense of maturity and responsibility. Surely looking after our family comes before everything else? I won’t argue with you there, but will it really hurt that much to keep an eye out for those around you. And those people around you include your boss and those placed under your authority at work. In corporate life we often see that good people are held back and bad people are promoted in order to get rid of them. This highlights the following problems: narrow focus on a managers own department, lack of care for the larger business and lack of care for those entrusted to the manager. Personally I’m of the opinion that the head of the company, be it the CEO, management team or one or more partners, set the business ethics of their company. In a positive sense this is the exact reverse of the image on the right or the line I quoted above. I truly believe that if a CEO sets out to honour his staff and invests in them he or she will yield a much higher return on their investment. I hope you are wondering what exactly I mean by ‘investment’. By investment I mean time, money (salary, bonus, secondary package etc) and vision. Hiring someone and not spending any of the above other than just money, bears the risk of just paying for a job done without the desire to see growth of the employee. An I do use growth in a very broad sense; maturity, skill, confidence and trust just to name a few. Having spent just over 6 years in the UK, I’ve come to see a trend where investment is something that an employee is expected to do himself. The problem is that this causes the workplace to become a confusing and fragmented place where individuals work hard to appease their bosses both at work and at home. Family life is sacrificed as all hope is lost for change, this is just the way it is and will be. Now why does that remind me about the general public opinion of UK politics?! Don’t answer that… Most people I know are disillusioned with work, going through the motion like the proverbial grindstone. Mouths to feed and mortgages to pay. Some manage to escape the extremes of London but I suspect many will find that though the pace may be slower the work ethics are similar. Luckily for the UK’s suicide statistics, this country is incredibly social. To the point where I’d say that The Netherlands has no work social life to speak of in comparison. I would dare to say that this may well be the key binding factor for employees to stay put, despite the abysmal lack of job security and the demands on our ‘out of hours’ efforts to maintain ones working position. Don’t get me wrong, I’m all for people who invest in themselves. However (for example) businesses that require employees to be 100% billable while also demanding study for accreditation in their own time for the sake of the wellness and continuity of the business can not count on my favour. Yet this seems to be the norm in the UK, why do people put up with it. Again the parallel to the political system is obvious, the task too big to even attempt or contemplate setting change in motion. In my book this is national apathy at it’s worst and it’s rearing its head in the two most important aspects of day to day life. Where are the CEO’s that invest in their biggest assets, their work force? That conduct their business with integrity, paying bills on time. Ensuring their sales force doesn’t sell pie in the sky and effectively managing their business ethics all the way down to the cleaners and caterers. 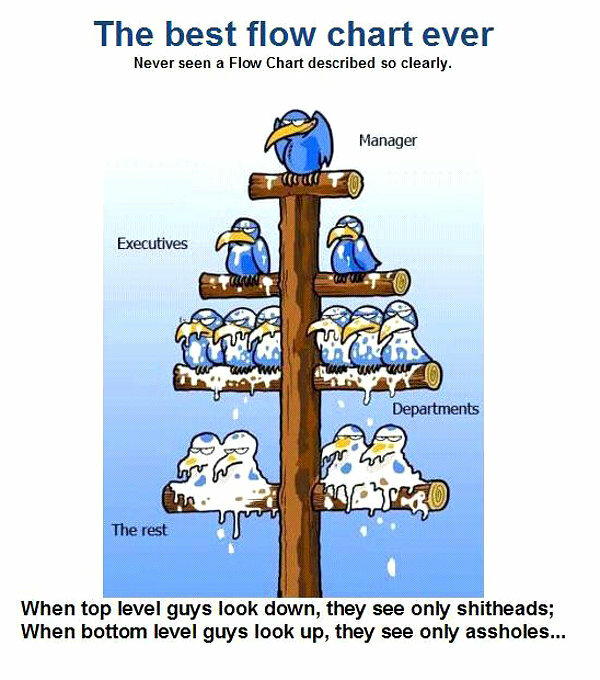 If you’re a CEO and your personnel turn over is above 20%, I dare say you are not managing your people well. My advice to you? Stop using thumb screws on your managers and start focusing on fostering a culture of trust, integrity, loyalty and value. Most people would value their family as top priority, so why don’t you start there? Ensure all your employees can grow within working hours, let working hours be working hours and give back time to the families under your extended care. I’m not proposing a lax approach to efficiency, but rather a change in priorities and means to an end. To our families to lead by example and not follow the herd of public opinion. To those in our care, those who depend on us for their livelihood. Whether we like it or not, when we lead we replicate ourselves. What legacy do you leave in your wake?